Post sponsored by CA Grown. See below for more details. 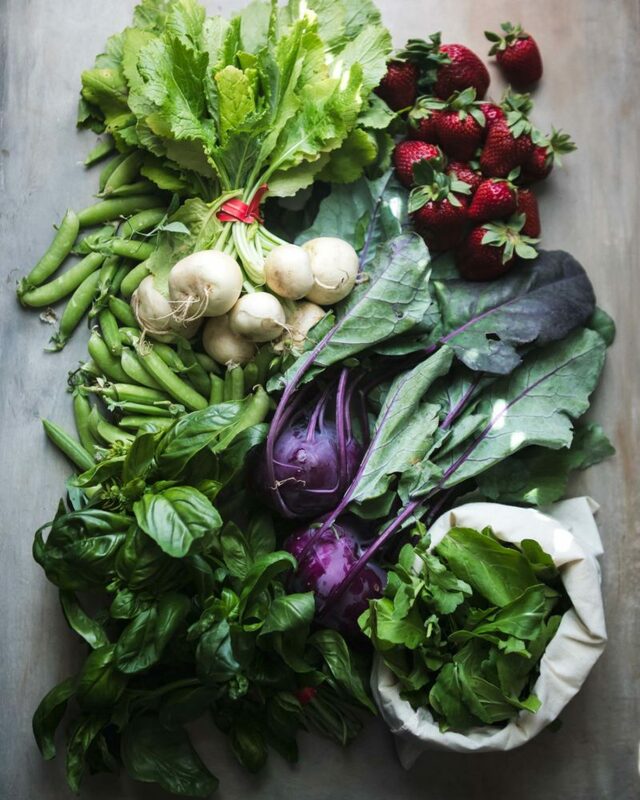 When it comes to summer salads, I’m constantly pushing to explore different flavors and textures. 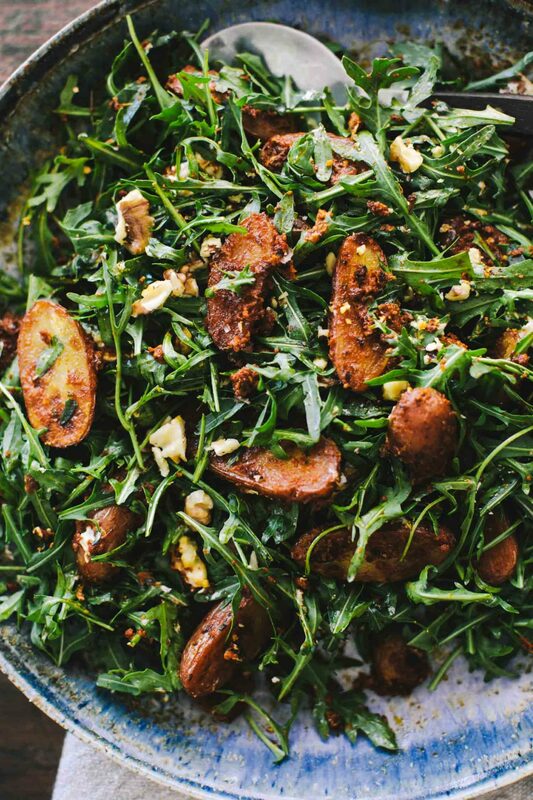 This arugula salad happens to feature a favorite combination of mine: a romesco potato mix. The smoky sauce brings the party to this salad, both as a coating for the potatoes but also as a bit of dressing. My favorite is to toss the salad together while the potatoes are slightly warm. The warm potatoes help to soften the goat cheese, creating an amazing coating for the arugula. Of course, if warm salads aren’t your thing, you could always mix the potatoes in when cool. 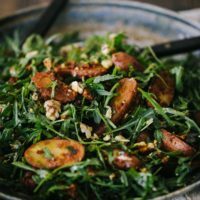 Best of all, this salad showcases so many of the items I love from local farms: arugula (Jayleaf), potatoes (River Dog Farms– one of my favorites), walnuts (Full Belly– also amazing), goat cheese (Laura Chenel’s), and olive oil (California Olive Ranch). What better way to showcase CA Grown. Vegan: Drop the goat cheese (it’s pretty simple!) If you do this, you might want to add a bit of lemon vinaigrette to the mix since the goat cheese would goat the salad a bit. Grains: If you’re lucky to find some California-grown grains, snap them up and add them to this salad. Curious who is growing grains? You can check out the California Grain Campaign. Nuts: Swap out the walnuts for almonds and/or pistachios (pistachios are fun- the flavor stands out a bit more than the walnuts or almonds). I’ve yet to meet a romesco potato combination I didn’t like! Heat your oven to 400˚F. Slice the fingerling potatoes in half, lengthwise. Toss with the olive oil and salt. Place on a sheet tray covered with parchment and arrange so that the cut side is down. Roast for 20 minutes. While the potatoes are roasting, make the romesco sauce. Combine all the ingredients in a blender and pulse until well combined. Once the potatoes have roasted for 20 minutes, remove from the oven and toss with about ⅓ cup of the romesco sauce. The potatoes should be well-coated. Return the potatoes to the oven and roast for another 10 to 15 minutes. Potatoes should be tender. Remove from the oven and let cool slightly. 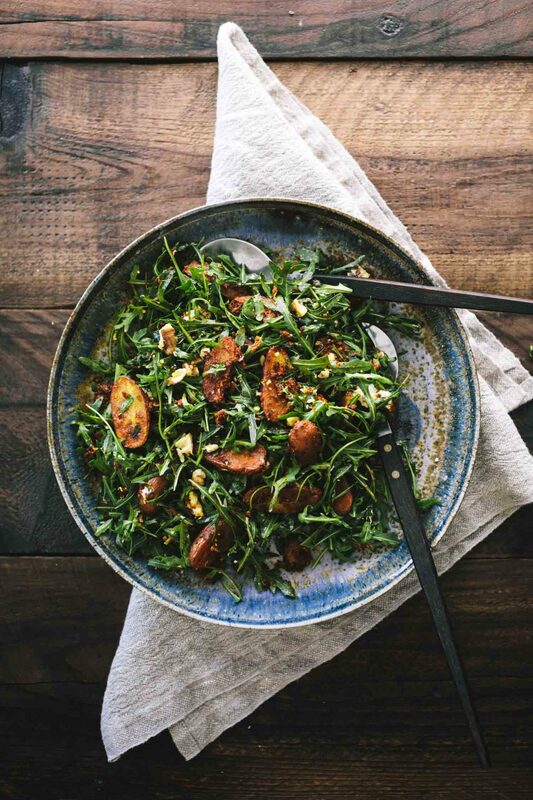 Assemble the salad with the arugula, crumbled goat cheese, roasted potatoes, toasted walnuts, squeeze of fresh lemon juice, olive oil, and salt if needed. Tips + Tricks: Save leftover romesco to use in another meal. It’s great on toast, with eggs, in pasta, or grilled cheese. Disclosure: This recipe was created in partnership with CA Grown. All thoughts and opinions are my own. It’s content like this that helps me keep this site running to provide the vegetarian recipes you see every week. I love this salad so much! I’ve made it several times now (without goat cheese though) and I honestly can’t get enough. I love using the romesco sauce as a dressing rather than just tossing the potatoes in it because it’s that good.